The given graph is for employment. However, labor participation has plumetted under Obama. It had a peek of 67% in 1998-2000, and it has steadily decreased since then down to 63%. It is quite misleading to say that the labor market is doing well. Lots of people are dropping out of the work force, and lots of people are switching to part time. Sorry, in my comment above I referenced Mark Perry—I think the actual results I saw on Tyler Cowen’s blog. I find the first chart incredibly misleading, perhaps deliberately so (it came from Mother Jones, after all). Net employment gain since Dec. 2007 has been less than 2 million jobs. I submit that much of the increase in private employment (as per cent of labor force) has been due to the large reduction in the number of people in the labor force. Mark Perry has shown that the reduction in the labor force participation rate is not driven by baby boomers retiring, as some have suggested. Anyway, given the reduction in the labor force, I think the first figure is simply a horrible way to look at the situation. 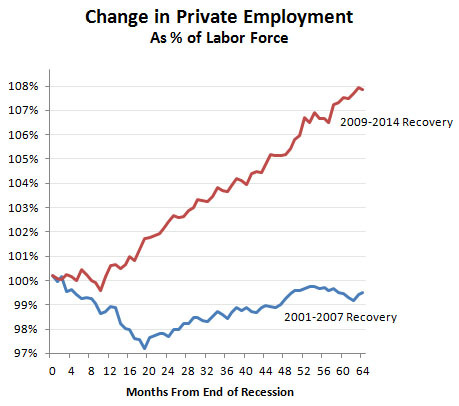 Yes, there has been some type of recovery under Obama, but there has never been a better setting for a recovery independent of fiscal policy: (1) starting from a low point, (2) incredibly low interest rates for over 6 years!, (3) the enormous economic benefit of fracking on private land, (4) falling oil prices. Any president with those things going for him or her is set up for high economic growth!